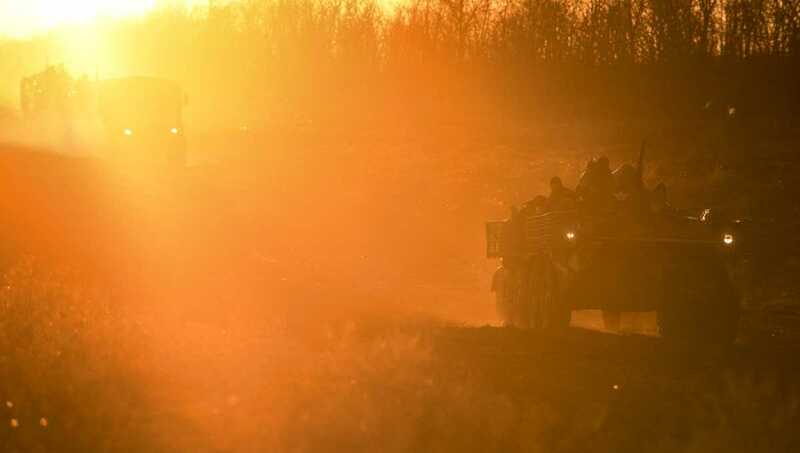 Photo: Ukrainian soldiers drive APCs near Urzuf, south coast of Azov sea, eastern Ukraine, Thursday, Nov. 29, 2018. Moscow, Nov 30 : Ukraine’s president says that the country has barred Russian men between 16 and 60 from traveling to the country. President Petro Poroshenko tweeted Friday that the restrictions on Russian travelers have been taken in order to prevent the Russians from forming “private armies” fighting on Ukrainian soil. The Tass news agency on Friday quoted Russian government-appointed ombudswoman Lyudmila Lubina as saying that the vessels’ commanders are being transferred to Moscow for interrogation. The other 21 remain in custody in Crimea.